Appropriation of every type of visual art, music, dance... even cultural attributes has been taking place since the dawn of time. You can bet that one caveman probably liked a drawing that another caveman created and copied it. Some appropriation is brazen such as Melania Trump using several of the same lines from a speech previously given by Michelle Obama. But most are more tenuous. With copyright infringement lawsuits plaguing artists such as Shepard Fairey for his well-known Obama Hope poster and Robin Thicke, Pharrell Williams, and T.I. for their hit song "Blurred Lines," artists in all areas should be treading a bit more carefully. This Saturday, July 30, "Save America," a political exhibition, opens at THE ROBERT BERMAN Gallery at Bergamot Station Arts Center in Santa Monica. It will feature an appropriation work created by RJ Berman aka Robert Berman, an artist and established art dealer. Berman began this political series in 2008. 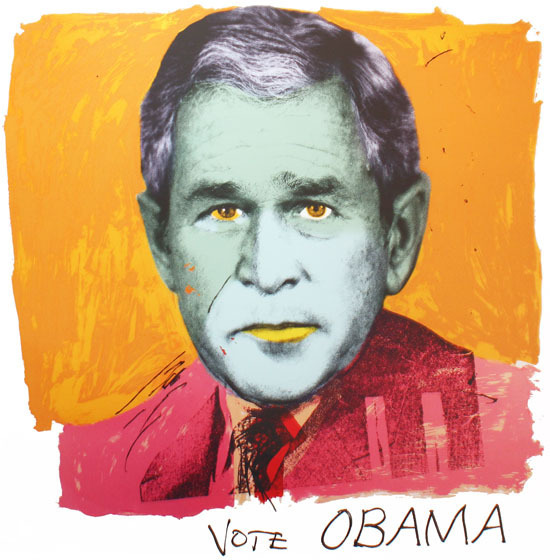 He was inspired to create a satirical political work of art paying homage to the great Andy Warhol. The art dealer has sold many Warhol prints and paintings throughout his forty-year career. The original mock up/collage, created by Warhol in 1972, depicts Nixon in a demonic light and reads Vote McGovern 1972. 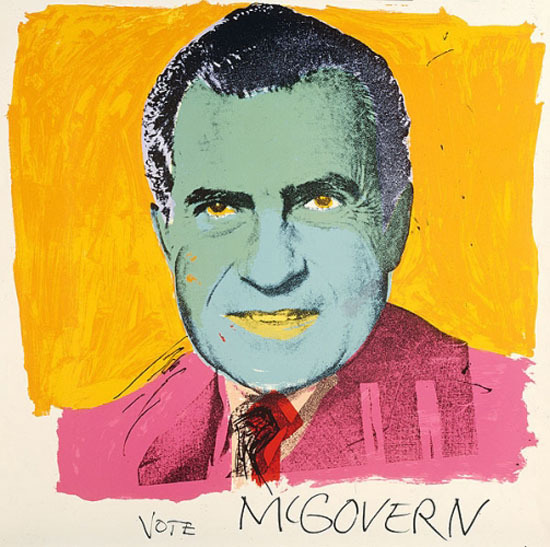 Prints were created from the original to raise funds for McGovern's campaign. 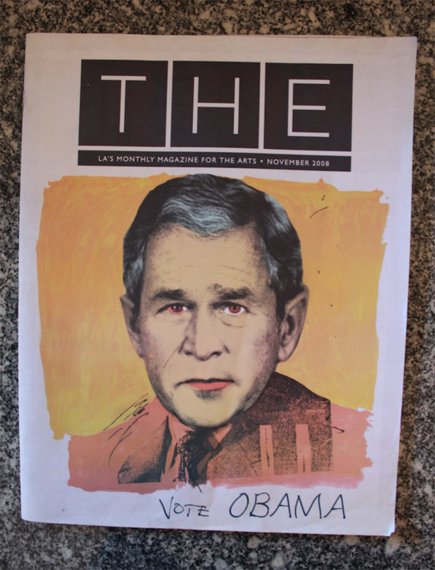 Berman created his first work of this series back in 2008 to disparage the Republican Party. 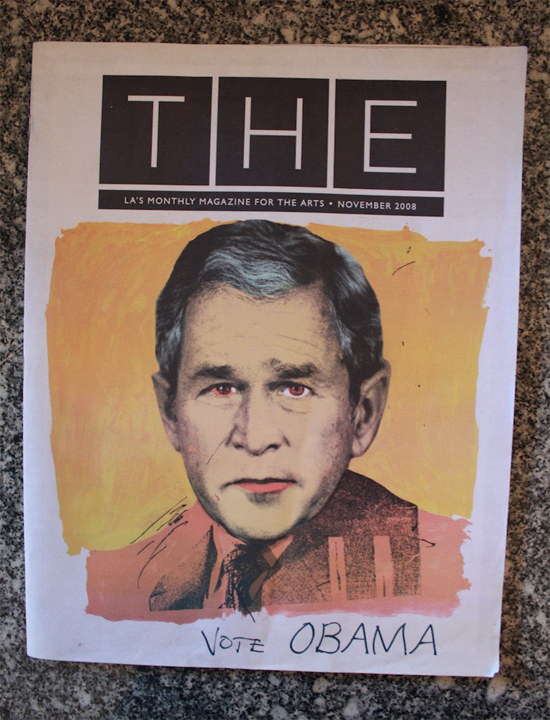 It portrays George W. Bush à la Warhol's famed Vote McGovern style from 1972. Berman collaborated with artist John Colao to create a photo composite. 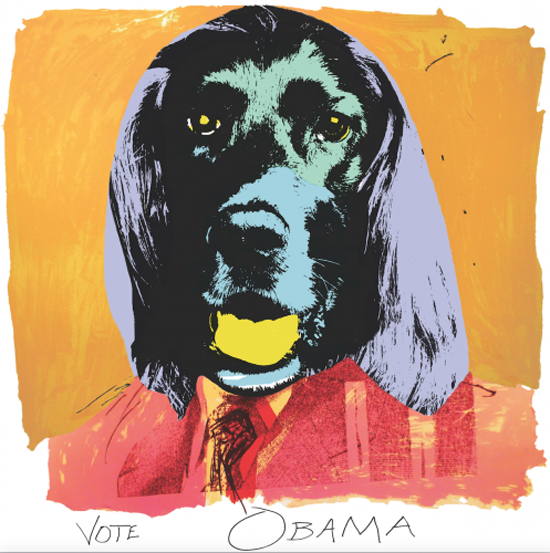 Underneath the Warhol stylized image, the phrase Vote Obama 2008 was placed. The work was printed in part by Jeff Wasserman, the same silk screen artist who created the original Warhol print in 1972. Wasserman has known Berman for over thirty-five years. "He's a good guy and he knows a lot about art," said the printer. In 1972, Wasserman was working at Gemini G.E.L., when Warhol sent in the original. Ken Tyler (partner/owner of Gemini G.E.L. at the time) delivered the silk screen edition to New York, where Warhol signed it for the McGovern fundraiser. Berman has continued his tribute each election year. Next, he featured an image of Seamus, Mitt Romney's dog whose carrier was strapped on the top of his family car for a twelve-hour trip. The image depicts the head of Seamus placed over a suited body... with the words Vote Obama. 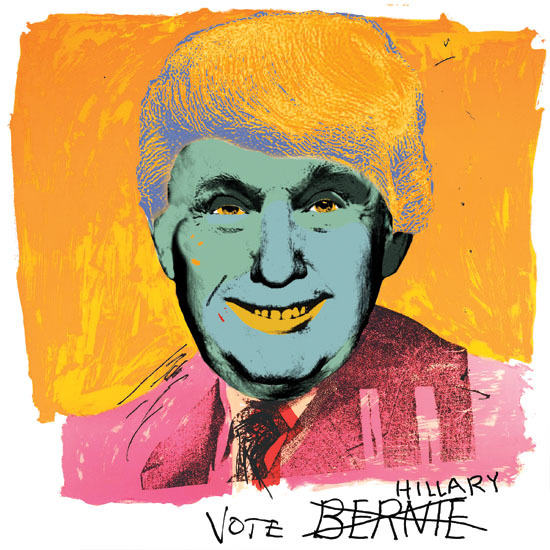 Finally, for this year's election Berman has featured a composite image of Trump with the words Vote Bernie, with an additional print which reads Vote Bernie, (in which Bernie is crossed out, and the word Hillary scrawled above it). Wasserman said he has enjoyed being involved in the election projects with Berman and expects to attend this Saturday's opening for "Save America" at the ROBERT BERMAN GALLERY. 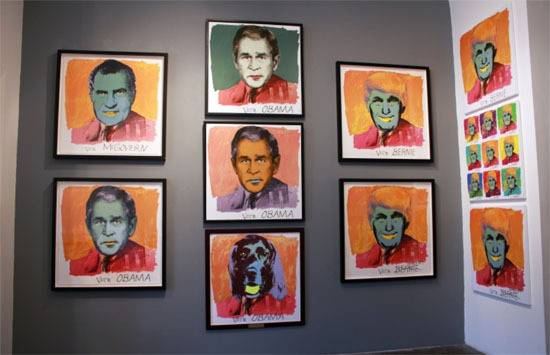 When asked what he thought Warhol would think of Berman's political series, Wasserman stated, "I would like to think that he would have a sense of humor about it." The public can view Vote Hillary and other political works this Saturday July 30, 2016 at the opening reception for "Save America" from 5-8pm. The exhibition will run through August 27, 2016. Artists include: Andy Warhol, Banksy, Sam Francis, Richard Serra, Alexander Calder, Roy Lichtenstein, Ed Ruscha, Shepard Fairey, Daniel Joseph Martinez, Jamie Wyeth, Raymond Pettibon, Robbie Conal, Ronnie Cutrone, James Rosenquist, May Sun, RJ Berman & John Colao, Christopher Felver, and Mr. Fish.